Chambers Fine Art is named after the distinguished British architect, Sir William Chambers who, in addition to his architectural practice, was a leading exponent of Chinese principles in garden design in the late eighteenth century. Inspired by the example of Chambers, Christophe W. Mao, founder and director of the gallery since 2000, has organized a stimulating series of exhibitions that have introduced the work of some of the best artists active in China today to an American audience. The gallery program has alternated between monographic exhibitions devoted to the work of established artists and thematic exhibitions organized by recognized scholars in the field. Thus the first exhibition in the gallery, First Encounter, was devoted to the work of the outstanding paper-cut artist Lu Shengzhong who converted the gallery space into a vividly colored “temple” that evoked another aspect of life in China than the contemporary urban culture explored by so many younger artists. Other memorable solo exhibitions in the last eight years have been devoted to the work of Hong Hao, Wang Tiande, Wang Jianwei, Qiu Shihua, Rong Rong and inri, Hong Lei and Qiu Zhijie. In contrast group exhibitions beginning with Cement: Marginal Space in Contemporary Art (2002) and Too Much Flavor (2003) and continuing to Blog It: New Wave of New Wave (2008) have introduced the work of a younger generation of Chinese artists to the American audience. These carefully selected “reports” on the latest developments in China contrast with monographic exhibitions devoted to well-established artists whose work is frequently being shown for the first time in the United States. Perhaps in reaction against the rapid modernization of China today, many of the most interesting artists find inspiration in the long history of Chinese culture. Wu Jian’an and Shi Jinsong have turned to popular culture for inspiration, the folk tradition of paper-cut and the colorful legends surrounding the mythological figure Ne Zha respectively. In Daydreams (2006) and The Heaven of Nine Levels (2008), Wu Jian’an’s paper-cuts achieved unparalleled levels of complexity while Shi Jinsong, working in stainless steel, provided a fearsome array of equipment for the youthful hero in Na Zha - Baby Care Guide (2006) and Ne Zha 2008: A Child’s Boutique (2008).Well known for his conceptual photographs of the 1990s, Hong Lei has recently used photographs of classical Chinese gardens for a series of paintings executed in fabric dye and embroidery on silk titled Seasons. Many of the exhibitions at Chambers Fine Art are accompanied by catalogs frequently designed by the artists themselves, as is the case with Lu Shengzhong’s First Encounter (2000) and The Book of Humanity (2004) and Chopsticks (2002) by Song Dong and Yin Xiuzhen. Working together for the first time, the highly regarded performance and installation artists Song Dong and Yin Xiuzhen used chopsticks as a metaphor for the bonds that unite them. 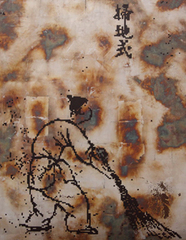 Two exhibitions of the work of Wu Jian’an – Daydreams (2006) and The Heaven of Nine Levels (2008) – have also been accompanied by memorable catalogs. Particularly noteworthy is the catalog of Rong Rong’s East Village (2003), the first extensive survey of the short-lived but influential artist’s community that included Zhang Huan and Ma Liuming. The exhibition coincided with the publication of a limited-edition portfolio of original photographs housed in an iron box with text by Wu Hung. Also noteworthy was the publication of New Photo- Ten Years (2007), a reprint of the seminal underground magazine published from 1996 to 1998 by Rong Rong and Liu Zheng. The opening of Chambers Fine Art Beijing in September 2007 greatly expanded our ability to represent the work of influential established artists as well as young emerging talents. The striking new gallery was designed by Ai Weiwei and is located in the Caochangdi district which is rapidly becoming one of the major centers of contemporary art in Beijing. The first exhibition in the new space, Net: Reimagining Space, Time and Culture was organized by Wu Hung and examined relationships between many of the artists associated with the gallery since its inception. Following this the exhibition Tan Dun: Organic Music presented a new series of visual works derived from the internationally celebrated composer’s Organic Music series while later in the season there were solo exhibitions devoted to Qiu Zhijie (Mochou) and Hong Lei (Seasons). Continuing our mission to create a broader international appreciation of contemporary Chinese art, the establishment of a base in Beijing has greatly facilitated our ability to work with the established artists with whom we have long been associated as well as with the best emerging talent from China.